Even today industrial leak detection is often simply bubble testing. Besides the subjective judgment of this method it is very insensitive, especially when components with long lifetime are concerned which should actually be "absolutely" tight. On the other hand, leak testing with a helium mass spectrometer is known to be very sensitive yet complicated and expensive. Therefore in industry it is often used only for premium components or in mass production. For the testing of production facilities e.g. in chemical engineering or for small lots of components to be tested helium testing is only worthwhile if there are no additional expenses for pump sets, vacuum chambers or training of personnel. To fulfill these needs, a new family of helium leak detectors was developed which has enough pumping capacity for larger test objects but can also detect helium flows down to 10-12 mbarl/s = 10-12 cm3/s (according to EN 1518) using a special signal conditioning algorithm called I CAL. The low detection limit is needed for system leak detection (vacuum furnaces, chemical plants) not because those small leakages are really existing but because of the large pump sets involved which do not leave much of the leak gas flow for the leak detector. With those modern instruments leak detection is reduced to the main things: connecting the test object, spraying helium and observing the display. Dirt or high pressure in the test object are tolerated over wide ranges. Even for inexperienced users errors caused by zero shift, wrong calibration or unfavorable parameter settings are practically excluded since the instrument independently cares for all those tasks concerning internal control and signal conditioning unnoticed by the user. Documentation of results is assisted by a PC-based software called "LEAKWARE" which either collects all the results measured on a specific test object or allows statistical quality control on a number of pieces. In industrial practice, helium leak testing more and more takes the place of older leak test methods like e.g. water bubble testing. This is because of the objective and quantitative results of the helium method in contrast to procedures with visual inspection elements (bubbles!). On the other hand, for helium testing appropriate helium leak detectors are needed which have to be designed according to industry requirements, i.e. they should not leave much to be desired concerning robustness, measurement accuracy and user friendliness. Such instruments then also fulfill the requirements on test equipment of the ISO 9000 set of standards for quality management systems. In this paper the requirements of industry on helium leak detectors will be explained by example of a modern mobile industrial leak detector. There are basically three methods of vacuum leak testing with helium which are described in EN1779 under the designations A1 (integral testing), A2 (partial testing), and A3 (local testing). In all cases there is vacuum in the test object so that the tracer gas helium which has been ingressing through potential leaks flows out of the test object into the leak detector where it is measured. Besides distinguishing these three basic methods the test of components and vacuum systems has to be considered separately. For components (e.g. valves or other assemblies) the leak detector does the whole job from supporting and roughing the test object, helium detection, leak rate display and finally venting. In system testing (a principal diagram is shown in Fig. 1), which is nearly equally as frequent in industry as component testing, the leak detector is not required to supply much pumping speed since the system pump does this job. However, it has to be much more robust and mobile to be used directly in the manufacturing environment. In both applications a good helium leak detector needs not only be able to measure the correct helium flow quantitatively but this must also be possible with appreciable amounts of water vapor present and resulting high total pressure. Industrial test objects normally are not so clean and dry as required by "doctrine". Therefore requirements on helium leak detectors for industry and on instruments for research are focused on different issues and hence products developed for the two applications are clearly different. 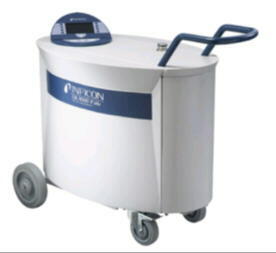 A helium leak detector basically is a complex measurement instrument which comprises a complete vacuum system to operate the mass spectrometer. When discussing its properties one has to take into account a combination of physical and electronic properties which together describe the behavior towards the user. In modern language, it is a "mechatronic" system. For research where the helium leak detector stems from, it was never a problem but often wanted to be able to adjust as many parameters as possible to adapt to the respective application. In industrial applications this has to be avoided although all the good properties, like sensitivity and speed are still wanted. Over all an industrial unit has to be robust which is not only meant for mechanical and electrical/electronic properties but also with respect to the measurement results. Fig. 2 shows a diagram with a triangle of optimizing the three essential properties of a leak detector. Every leak detector must be sensitive, fast, and robust, but the priorities are different for research and industry. When talking about the sensitivity of a leak detector actually the detection limit is meant, i.e. the minimum detectable leakage rate. How this limit is defined and what is the state of the art today will be discussed below. It is easy to understand that speed is the first priority for an integration in industrial manufacturing processes. It is key to loose as little time as possible from providing the test object until displaying the measurement result including a "good/bad" decision. Robustness often is a synonym for industrial suitability. In particular, this means that a unit is insensitive against all kinds of environmental influences, including electromagnetic and other artificially generated interferences in industrial areas. It is obvious that an instrument being "sensitive" in detection limit shall be "insensitive" (against interference). This contradiction is the real challenge for developers to present a robust yet measurement-sensitive instrument. To put industrial requirements into practice there are some important elements which are shown in Fig. 3. The time period required for a test cycle in vacuum leak detection is basically determined by the time for roughing and pumping of tracer gas, in short, the time required for the necessary gas exchange in the overall system of test object/leak detector. To keep these times short the pumping speed at the test object must be as high as possible. This is normally opposed by the requirements on sensitivity and mobility (size and weight) of the instrument. Only solutions that can combine both aspects in an optimal way are really innovative. Robustness of an instruments is demonstrated by insensitivity against interference. Most prominent in this respect are all interferences that affect the action of leak detection itself: these are mostly dirt and moisture from the test object. To handle such test conditions a counterflow leak detector with an oil-sealed vane pump is most suitable which can handle particles as well as vapour-like contaminations in an optimal way. A dry fore pump (e.g. scroll or diaphragm pump) has serious problems under such circumstances and is not at choice. To detect leaks as small as possible the direct flow leak detector was a good choice some time ago. Here, the tracer gas was admitted directly into the high vacuum and the mass spectrometer. Since a cold trap is mandatory with this principle, in industry the counterflow leak detector has become the best choice. It has however slightly more difficulty in detecting very small leak rates. In those cases only intelligent signal processing can help which minimizes all signal interferences especially drift and noise. Taking a newly developed mobile leak detector as an example, according to the above requirements there will be solutions described which were realized with modern means. 4.1	Basic instrument properties The UL1000 is a helium leak detector developed for mobile use in industry. Its main tasks are maintenance and service of stationary vacuum systems and testing of small lots of components. Although the styling if the instrument is unusual and attracts the attention of people the functional aspects were not neglected but cultivated. thinking of use in service the focus was on good mobility, i.e. a low center of gravity was combined with large wheels and a very stable handle which enables easy handling with good "road contact". Tilting has thus been made impossible even with "wildest" driving manners. Smaller obstacles like cables or steps are easily coped with. The specific properties to realize the basic requirements for speed, robustness and sensitivity are described in the following paragraphs. The unit is ready for measurement when the required vacuum pressure is achieved in the test object. In the first place a high pumping speed is required during roughing. In the UL1000 this is realized by a 30m3 scroll pump resp. a 16m3 rotary vane pump. As the maximum inlet pressure is 15 mbar in the UL1000 (that high because of a high-compression turbo pump) only a short time is required, dependent on the test object volume, until this pressure is achieved and the instrument is read for measurement. To get a direct answer in measurement mode on any helium ingressing into leaks even with a larger test object volume the leak detector must have a large helium pumping speed in all modes. In the UL1000, this is guaranteed by the large roughing pump (in gross leak mode) and a pumping speed of the high vacuum pump of several liters per second at the measurement port. A powerful pre-amplifier, capable of measuring electrical currents down to 10-15 Amp with a time constant in the order of seconds is the prerequisite for an overall quick reaction on leaks. At the same moment when the UL1000 detects an excessive leak rate all valves are closed to minimize helium contamination. If, in spite of that, a larger amount of helium has been introduced by a gross leak the leak detector must not be blind for a longer period of time. Moreover, an increased helium concentration in the ambient ("contamination") must not have adverse effects on the measurement results. This is a requirement not easy to be fulfilled for an instrument that detects smallest leaks with high sensitivity. In the UL1000 instead of O-rings flat gaskets are used that have only a height of 0.3mm and a sealing width of 7mm which enables a very effective sealing technology and at the same time safe and simple handling. Helium permeation from ambient contamination thus has no effect. The specifically qualified pumps add their share: they have such a high compression ratio that helium cannot counterflow into the detection system. A background signal generated by contamination from gross leaks can quickly be reduced to an uncritical level by air purging which is partly automatically controlled. The rest of the falling background can then be controlled by modern signal processing (gliding AutoZero). Concerning robustness, above there were some remarks about the basic properties of the UL1000. Adding to those properties it is essential that all components are capable of sustained continuous operation over a period of many thousand hours (a car normally only works during about 4000-5000 hours of operation!). Even with faulty operation - the worst would be an air-inrush into the vacuum - there is no damage but the instrument goes back into measurement mode automatically. This is possible because even sensitive components are designed to be robust enough. For example, the filaments made from Iridium tolerate oxygen from the air at their operating temperature of 1700°C and the rotor of the turbo molecular pump survives sudden venting many hundred times. Talking about dirt, industry has the highest requirements regarding particulates and vapor like contaminants. By first pumping via a roughing line the UL100 makes sure that no particulates can enter the high vacuum. The inlet valve in this line is designed to be accessible and can be easily cleaned. If operated in parallel to a second pumping system the UL1000 hooks up only at 0.1 mbar in this way preventing that any dirt enters the system. Although the question about sensitivity of a leak detector is always asked first I would like to title this paragraph with the header "Measurement Properties". As will be shown later the quality of an industrial measurement instrument is not only determined by its detection limit but by its measurement certainty. This word is not standardized but it is meant to say that even the unskilled user can rely on the results on the display. The highest virtue of a measurement instrument is its stability which is made up from drift and noise. What these two characteristics have to do with the detection limit can be read in EN 1518. In principle, the detection limit is the sum of the noise and the drift per minute keeping certain rules during measurement and evaluation of results. 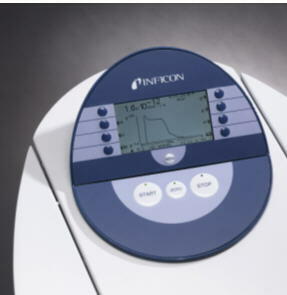 A second important property that can only be delivered by the inner detection system (here the ion source in the mass spectrometer) is a high signal sensitivity. This quantity states the amount of output current (in Amps) which is generated by a certain test gas pressure (in mbar). For a good ion source, this sensitivity should be pressure-independent up to the highest vacuum pressures. The detection system of the UL1000 is capable of safely detecting ion currents down to the 10-15 A-range and the ion source has a sensitivity of some 10-3 A/mbar at total pressures up to some 10-4 mbar. An amount of gas of 1 mbar x Liter is equivalent to 1 bar x cm3 = 1 Ncm3. (1Ncm3 is one norm cubic centimeter=one cubic centimeter, filled with gas at normal pressure). or a droplet in 30 years! To detect such small leakage rates without long pumping times even in a large vessel with large amounts of water vapor desorbing from its walls additional measures are necessary. A patented suppression of the hydrogen signal generated by desorbing water vapor is being prepared. That will put an end to long pump-down times of large and moist test vessels. For industrial use the operating properties of an instrument are of great importance since frequently changing personnel has to work safely with the unit. Apart from the above mentioned protection and signal processing functions the operating unit with display and keypad is predominantly responsible for good or bad operating properties. The UL1000 uses the proven concept of an ATM machine as its user interface. In this way a maximum of functions is achieved with a few clearly arranged buttons using the concept of "soft keys". The realization is shown in fig. 5. In the graphical display measurement values can be represented in a great variety of ways. The integrated recorder trace of leakage rates vs. time is one of the unique features of the UL1000. Linear or logarithmic scaling with different range limits is simply possible at any time. It is the first time in a leak detector that a firmware update is possible via interface. In this way it is now possible to let the customer participate in every improvement of the unit which are nowadays mostly improvements in software. Except for a PC with web access and an interface connection to the leak detector there is no need for further equipment. To prepare the update the user downloads a so-called "run-time-engine" form the internet and installs it to his PC. The new software for his leak detector is then sent to him per e-mail. By simply starting the run-time-engine the interfacing to the leak detector is first checked and then the new software is transmitted directly to the CPU of the leak detector. After about 4 minutes the user can work with a "new" leak detector. If the leak detector is used for process control in serial manufacturing a statistical presentation and evaluation of the gained measurement data is necessary. The process control software package "LEAKWARE" makes it possible to store all measured data with additional information and make a basic statistical evaluation in time series and histograms. Fig. 6 shows an example for possible results. With the UL1000 family of leak detectors the industrial requirements for speed, robustness and sensitivity were realized in an optimal way by innovative signal processing and novel operation properties. Therefore these leak detectors differ significantly from conventional units which have been defined mainly with the requirements of scientists in mind.